I saw this undercounter lights and they looked real sharp and modern. Check it out. Last edited by distributor x; 01/23/12 02:28 PM. FWIW, I had a lot of really good experiences with Starfire over many years. They make quality items; and stand behind them. Pricey? some may think so, but a lot was 'made to order'. An added bonus is...Made in the USA!!! Yes, this would be great in LED. I saw them in a kitchen and they did look great. They were custom made and they went end to end right over the counter top. This and most other pre-boxed under-cabinet lights would not fit in my existing cabinets. To use these, I'd have to make sure the future cabinets in the new build have more space underneath. What I have found online are lots of LED strips. These are basically a long rolled (3 to 16 foot lengths) thin strip like a flexible circuit board, usually with an adhesive on the "dark side". Most run on 12VDC. They can be cut at designated points usually spaced at intervals of 1 to 3 inches. Especially interesting are the controlled RGB ones. Each color at each LED can be set to one of 128 levels, allowing for 2,097,152 colors. The system works on a cascade: when a new color signal is sent, the whole system shifts the colors away from the input end. These shifts can be done fast enough that the eye can't see the whole strip being reloaded. There is also a Christmas Light string that works the same way, and a controller with a remote. Only their line AC to 12VDC adapter has an enclosure. But since everything past the adapter is low voltage, I guess it is considered safe? I can still imagine an overloaded string being wired together that could overheat (they make adapters up to 10 amps). Now if I could just find a power adapter I could easily hide. But I like the strips because they can be hidden in the 1/4 inch space I have. Several online lighting and hobby retailers with LED lights have these. Google for "led light strip"
I spent time looking for UC lighting for my new kitchen a few months back. I saw the LED strips, LED fixtures, hockey pucks, mini-track setups, etc. Some of the 'real high end' stuff made my head spin! Kichler LED was over $1400. I found LED units at a big box, in stock, lengths worked, built in dimmers, 120V plug-in, with jumpers for chaining additional units. I also took the 'light molding' option with the cabinets, that gave me 1-1/4" total edge. Fixtures are approx. 3/4"
Everything in the box stores was going to hang below the edge of the cabinets, since there is very little space under them (about 1/4 inch). To hide them, I'd have to locate them toward the back. But that would not give me the light distribution I want as a counter top task light. SO I'm definitely thinking of going with the strip lights. I'm looking for a power adapter I can then mount under the cabinet near the back (where it won't be bad to hang below the 1/4 inch level). I just need to find one with an IEC inlet on the side, preferrably grounded (e.g. the "mickey mouse" type inlet a lot of laptop adapters use). Gotta find where my industrial catalogs (Digikey, Grainger, etc) walked off to. I ended up making my own under counter low voltage lights. This is fairly low level lighting, just enough for a bar but it is 8 LEDs from some cheap battery lights I bought, wired in series with a little ballast resistor, running off a wall wart. They are set in a piece of wood that matches the cabinet and less than 1/2" thick. I see the Johnny Walker isn't too far away. 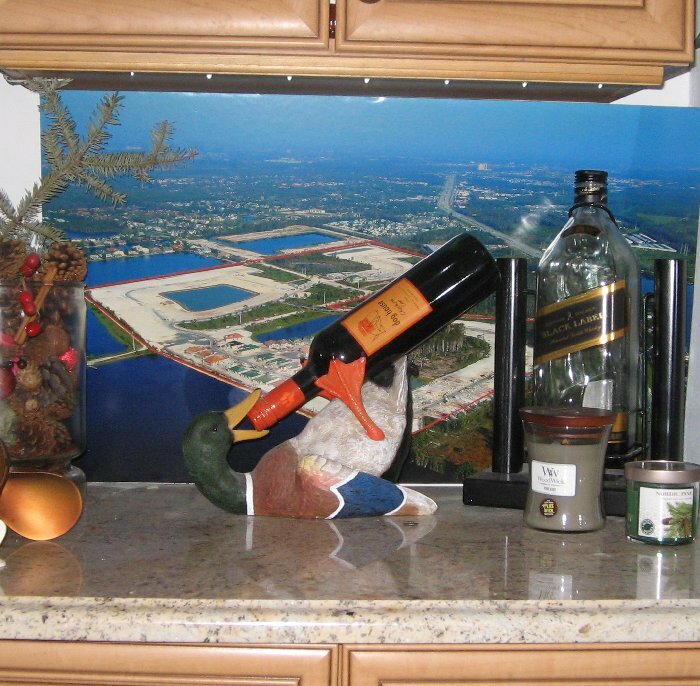 Plus I love the "Drink duck"! We found that duck in a tourist trap near Lake Placid NY.